Quite simply, raw cannabis doesn’t have the psychoactive properties that we all associate it with. It needs to be heated through a process known as cannabis decarboxylation first. This is necessary in order to release carbon dioxide (CO2), release cannabinoids from terpenes, and turn non-psychoactive THCA into THC. Home decarboxylation is simple. The key is to have the correct timing and temperature. But while the at-home methods can be easy, they don’t achieve full decarboxylation. That’s because of the following issues: residential kitchen appliances have too many heat variations plus the ability to reach and maintain the necessary temperature for full decarboxylation (220F-310F) varies — meaning you need high heat for a shorter time or low heat for a longer time and, unless you are a professional working with commercial equipment, you can’t always tell which is needed more. One thing to remember: the lower the temperature the fewer terpenes are lost, this is vital because terpenes produce cannabinoids, including THC. When you first attempt decarboxylating cannabis, it’s going to be a case of trial and error. You may get slightly varying results — especially on your first attempt — as accuracy at home is not easily controlled. Go slow using what you decarboxylate. Often when home decarboxylating, you can under, or over-estimate the heating process — especially when decarbing new strains for the first time. It can also be a very pungent process, so make sure you have good ventilation. Below are a few different, simple methods you can try at home. This is one of the most popular ways of decarboxylating at home—literally heating cannabis in water in a boiling bag — because it’s the least pungent method (releasing the least odor, which, we cannot emphasize enough can be strong). Another benefit to this method is temperature consistency. 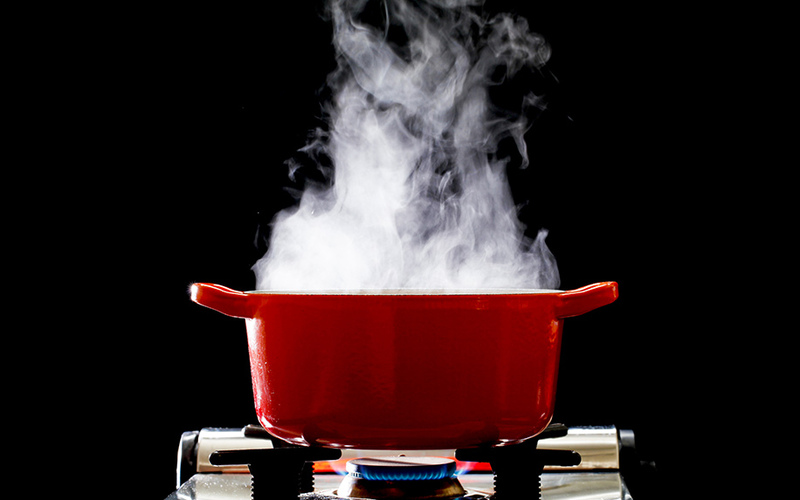 Water boils at a constant temperature of 212 degree Fahrenheit (100 degrees Celsius). So while you’ll have more control with this method than you will anything that involves an oven, there’s a catch: The temperature of boiling water is not enough to result in a full decarboxylation. Decarboxylation requires a minimum temperature of 220F, and no higher than 310F. At 300F, degradation (of the terpenes that release the cannabinoids) occurs. So, decarboxylation at 212F in constantly boiling water will take a while. So stick to the chart’s times and temperatures for best results. To bag-and-boil cannabis, you’ll need to use resealable, boil-safe bags. Grind your cannabis into a coarse powder and seal it in the bag with room for air expansion. Push as much air as you can out of the bag before sealing. If you don’t and fill your bag too full, the heat expansion can pop the bag open. Bring the water to boil, slowly lowering the bag into the water. Leave to boil for at least 90 minutes. At this stage, it’s important to keep an eye on the water level to avoid the water evaporating and the bag melting. Keep topping it up with boiling water to keep the temperature consistent throughout the process. This is why a Crock Pot is a popular boiling vessel as it minimizes evaporation. When you’ve reached 90 minutes, remove the bag from the water with tongs and let the bag cool on a cooling rack. After it’s fully cooled, the cannabis is ready to use in recipes. You can use any oil to make cannabis-infused oil — many find coconut oil, olive oil, and grapeseed oil to be best. A bonus of this method is you can use cannabis-infused oil on salads as well as in any other recipes that require oil. Firstly, make sure your windows are open for ventilation. Finely and evenly grind your cannabis and add to your oil. Start with 1 cup of ground cannabis to 1 cup of oil and adjust to your liking for a stronger or weaker potency. The ground cannabis should be floating freely in a good amount or oil. If not, it may burn and ruin the cannabis. Cook your oil with the cannabis on a low heat for 3 to 8 hours. After your cannabis oil has been boiling a few hours, remove it from the heat and let it cool completely. Strain your cannabis oil through a strainer lined with cooking cloth into a large bowl. When you’ve strained the cannabis from the oil, remove the cheesecloth and gently squeeze out any excess oil. Now you’re ready to use your cannabis-infused oil. To bake cannabis, first preheat your oven to 240F — which is the optimum baking temperature to release terpenes. Again, be sure to open all the windows — baking cannabis releases a very strong odor. Grind up your cannabis into a coarse powder. Many people use a coffee grinder to do this. Then, spread the ground cannabis in a thin layer with no clumps onto a large baking pan fully covered in aluminum foil. As a rough guide, bake half for 40 minutes. Set a timer to prevent the cannabis burning. It should be a golden brown color when you take it out of the oven. Cool it for use in recipes anyway you like it, as above. Because oven temperatures can fluctuate by as much as 10 degrees up or down, it’s not exact. Like baking a regular pie, keep an eye on the cannabis and pull it out earlier if you think it’s on the verge of burning.